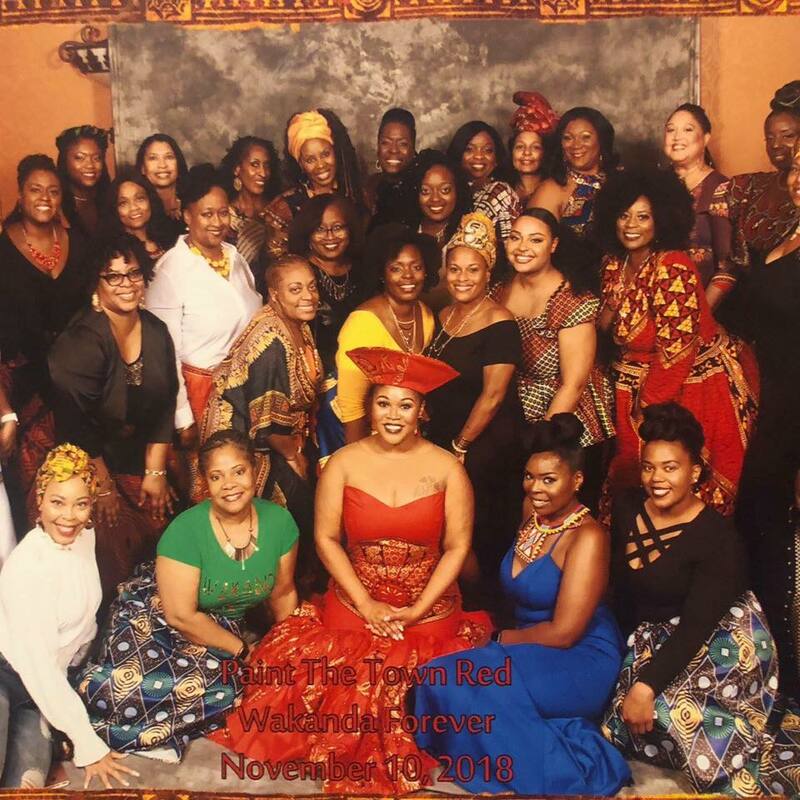 Chapter President Jayme Broome (2nd row, 2nd to the left in black; Event Co-Chair Cayla Broughton (front row center in red), Event Co-Chair Courtney Tucker (front row, right center in sapphire blue); Immediate Past Chapter President Sandra Quince (first row, far right in black). A good time was had by all at Delta Sigma Theta’s Annual Paint the Town Red Scholarship Fundraiser held on Saturday, November 10, 2018, at the Renaissance Hotel. The sorority’s theme was “Wakanda Forever”! Members and guests alike were donned in African inspired attire. Each year the sorority awards thousands of dollars in scholarships to deserving graduating high school seniors. “Paint the Town Red” is the Tulsa Alumnae Chapter’s signature event to raise those funds. It allows the sorority an opportunity to party with a purpose and provides an opportunity to thank the community for its constant and unwavering support of our efforts”, explained Cayla Broughton, this year’s Paint the Town Red co-chair. Last year, the sorority awarded scholarships to David Illum, a Memorial High School graduate now attending Stanford University; Marisol Delma Rogers High School graduate now attending the University of Tulsa; and Korie Hilliard, a Booker T. Washington High School graduate, now attending Langston University. Because of the support shown to us by our community, we can continue our practice of awarding scholarships to graduating high school seniors, said Jayme Broome, President of the Tulsa Alumnae Chapter of Delta Sigma Theta Sorority, Inc. Scholarship applications for this year’s graduating seniors will be available February 2019. President Broome, continued by saying, “We are overwhelmed by the support our community demonstrated this year. We especially wish to thank our elected officials who attended the event, District 73 Representative Regina Goodwin, District 1 City Councilor Vanessa Hall Harper, and recently re-elected District Court Judge Sharon Holmes. We were elated to be able to celebrate with Judge Holmes after her land-slide win over her opponent Blake Shipley just days before the event. The festivities included a “roll call” where organizations of the Tulsa area National Pan-Hellenic Council (the Divine 9) greeted and delighted the audience by entering the venue with its respective signature stroll. Members of the Devine 9 include not only Delta Sigma Theta Sorority, Inc., but also Alpha Phi Alpha Fraternity, Inc.; Alpha Kappa Alpha Sorority Inc.; Kappa Alpha Psi Fraternity, Inc.; Omega Psi Phi Fraternity, Inc.; Phi Beta Sigma Fraternity, Inc.; Zeta Phi Beta Sorority, Inc.; Sigma Gamma Rho Sorority, Inc. and Iota Phi Theta Fraternity, Inc. The guests expressed their admiration of the best dressed by selecting Mr. and Miss Wakanda, MJ Johnson and Morgan Williams. Chapter President Jayme Broome and the event’s Co-Chairs Cayla Broughton and Courtney Tucker, on behalf of the Tulsa Alumnae Chapter of Delta Sigma Theta Sorority, Inc. thank the greater Tulsa community for its support of Paint the Town Red: Wakanda Forever. Because of the community’s support we will be able to continue awarding scholarships to deserving high school seniors. Again, thank you so much for your support. We hope to see you again next year.